This is Sam, 3B Scientific's Skeleton Model with Muscles and Ligaments. Sam has all of the benefits and advantages of 3B's original Life Size Human Skeleton Model with the addition of demonstrable movements in the skull via the head joints. The spine is also fully flexible, which allows students to adjust Sam into natural body positions. The back is made even more realistic with the addition of protruding spinal nerves and vertebral arteries, as well as a slipped disc between the 3rd and 4th lumbar vertebrae. 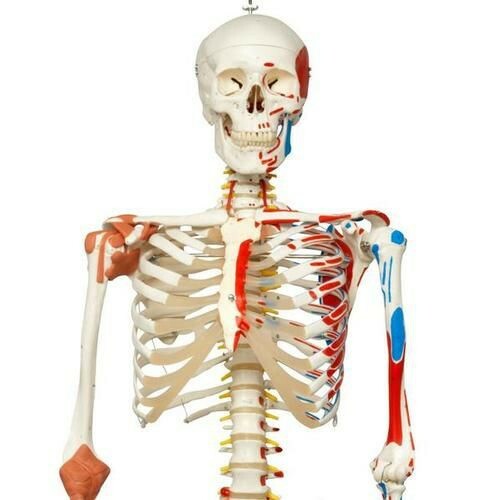 Sam also features hand-painted muscle origins and insertions, as well as over 600 numbered, labeled details of the Skeleton Model's structures. The limbs on the left side are fully flexible, with full flexibility of the right knee and hip and limited flexibility in the elbow and shoulder. Sam's unique combination of features make this model a great choice for any classroom or office. Over 600 Hand-Numbered, Labeled Details. Hand-Painted Muscle Origins and Insertions. Slipped Disc Between the 3rd and 4th Lumbar Vertebrae. Protruding Spinal Nerves and Vertebral Arteries. 3-Part Assembled Skull with Individually Inserted Teeth. Top Quality, Life-Size Natural Casting Made In Germany. Close to the Realistic Weight of Around 200 Bones. Full Flexibility of Limbs On Left Side, Right Side Has Full Flexibility of Knee and Hip with Limited Flexibility of Elbow and Shoulder. Exceptional Value For Money with a 3-Year Guarantee. Available In Two Different Stand Options.